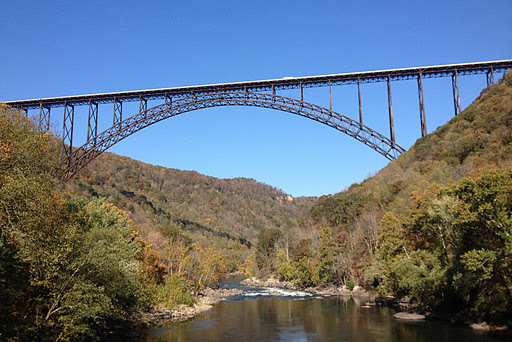 My wife and I headed over several mountains and deep into the heart of (former) coal country this weekend to celebrate our anniversary by doing the second annual Run Around the Gorge. I’ll put the punchline first here: Do it next year. Mark Lattanzi, an accomplished adventure racer and unbelievable host, has set a course in and around the New River Gorge that is an awesome mixture of rail to trail, shag trail, contouring rollers, uphill, downhill, and country roads (total breakdown is 46 k of trails and 16k of country roads). The weekend is more “running retreat” than race, depending on what your mentality is. It is 100% the most beautiful course I’ve run to date and is a fantastic bridge weekend for those looking to move to longer distance (ask my wife Heather who had a blast this weekend) and a killer training weekend for those of us who love to go real long. The weekend centers around the opossum creek resort, which *you run back to each day* after starting at two different trailheads. The resort is quiet and the accommodations are beautiful and nestled privately in the woods (our cabin had its own hot tub, yes, you read that correctly). This weekend was the apex of my high mileage week, and it was a test to see if I could maintain a steady, quick pace after the several months of much higher turnover workouts (including the potentially infamous Skinny B workouts). I also wanted to check in with myself mentally before I toe the starting line at the Lithia Loop trail marathon in two weeks which sees some serious trailblazing (2:40 was Max King’s winning time last year). In other words, I had set myself to run fast and see how it would last. Friday night kicks off with a pizza party, friendly outgoing runners, beer, wine, and a very laid back race brief (the best kind). We headed out the trailhead Saturday for a 24 mile run, beginning with some flat rail trail spiced with a dash of technical downhill. Yes, please, I’ll have seconds. We then climbed up a country road into old mining territory and along contouring trails with a full sweeping vista of the gorge as we ran through miles of shag. We then dumped back onto an impossibly switch-backed country road leading up a wall of pavement too steep to be believed. The last quarter mile was a rip-roaring trail back to the cabins. I ran out in front after the first couple of miles and very narrowly edged out two awesome (and very fast) adventure racers & ultra runners Kristin Eddy and Scott Pleban. Day 1, 24 miles, 3:05. Recovery included a massage from a therapist on site, hot tub, and smores. Yes, indeed. Sunday was a little colder at the start, and it was staged so that the last runner from Saturday started first. It was awesome to see everyone over the first several miles of the course and kiss my wife on the way down into the gorge and then the steady hard climb up Beauty Mountain. It was a technical climb at points, but steady, and I was ready to turn it on so I blasted it up the mountain and out onto a connector gravel road. 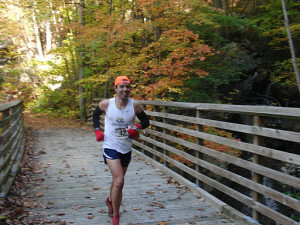 The second half of Sunday presents a runner with a choice of the “adventure trail” which has bouldering and ladders, or I guess what could be called the “bobsled run” a very fast, spectacular trail along the rim of the gorge and plunging through rhododendron on your way back to the cabins. Day 2, 16 miles, 2:14. This run is a blast, and a HUGE value when you add up all meals, aid, marked course, transport to start, accommodation (refer to hot tubs above) , beer, wine, sodas, water, fleece, finisher medal, prizes…it is really amazing. Add that to the camaraderie of a small group of runners, running back to your cabin site, and the fall colors it is an awesome experience. There is a ton to do in the area with mountain biking & hiking galore, and most everyone was there with their spouse (though we were the only couple that both ran). Interested? Mark your calendar now! Great report, Mike! This one may have to go on the calendar for next year. What a fun report dude! And excellent job on the two-day run. The whole weekend sounds like a blast. Thanks gents! Definitely mark your calendars for next year. Mike – great write up. I have spent some time in the gorge, but mostly on a raft. It is a “gorgeous” spot and great fora run this time of year. I also heard about this event and was intrigued but couldn’t make it work out. Hopefully next year. Thanks for the report.